WordPress is a great tool for a small local business. It allows a business to have an online presence without breaking the bank. WordPress has many features that help a small business owner create a website that can create community awareness and generate new business. Keep reading to see five features of the best WordPress websites for local businesses. Small business owners have to wear many hats for the business to run properly. Therefore, they need many functions to work as smoothly and easily as possible. WordPress fits the bill for publishing web content. Since publishing content is so easy with WebPress, it frees up more time for a business owner to work on other aspects of the business. This feature is also helpful to small business owners because it is ideal for content marketing. Since recent marketing strategies focus largely on frequently changing content (including articles, posts, tips. Links, etc.) on a website, a small business owner needs to be able to change the content quickly without needing to have a background in HTML or CSS. Themes and plugins combine to create a completely personalized website for a small local business. Themes allow a small business owner to change how the website looks. Themes also have features that assist a business owner in running the site. For example, some themes contain support for “shortcodes” that allow for the insertion of snippets of text that WordPress will convert into HTML. Another theme allows for the use of widgets that facilitate customizing the look of the site’s sidebar. Plugins are similar to themes, but they add more functionality to the site. They are both easy to obtain and install. There are many popular plugins that make using the site easier. Regardless of the function a business owner wants to accomplish, there is likely a plugin for it. A true benefit of plugins is that they make virtually every function possible and easy. Business 2 Community points out that small business owners should look for technology that aids in the functioning of their business. It is important to use one that has a large support network in case assistance is needed. WordPress fits the bill. Technologies that are not widely used tend also to be lacking in software developers and designers. So, if a small business owner is ever in need of assistance, it is difficult to find help. Since WordPress is so popular, it boasts a large staff of software professionals. So, assistance is easy to find and access whenever it is needed. This feature saves a small business owner precious time that can be better utilized in other aspects of the business. WordPress uses standard technology that is easily understandable, even for the most technologically-challenged local business owner, and it can be found on most web hosts. Some more complicated web development platforms require some specific technological know-how that many small business owners do not have. Some even require the business to have their own web server, which is not possible for many small business owners. Conversely, all that is necessary for WordPress is Linux, Apache, MySQL, and PHP, all which can be found easily. Further, WordPress can be installed by simply filling out an online form and clicking the “install” button. No technological knowledge is needed at all. WordPress started as a blogging platform. Thanks to its built-in RSS support, it is easy for visitors to subscribe for updates. This is an especially important feature for a small local business owner because it enables visitors to the site to easily come back for return visits. So, if they do not purchase something the first time, there is the possibility they will do so during a future visit. Having the option to subscribe for updates negates the need for a visitor to waste time with unnecessary visits, as an update will let them know when new content is available. Similarly, providing a way for visitors to leave comments is a great way for a small local business owner to keep updated on the pulse of the site’s visitors. Having an easy way to communicate and interact with site visitors helps a business owner know exactly what their wants and needs are so they can be provided with optimal service. WordPress is a great idea for any local business owner. 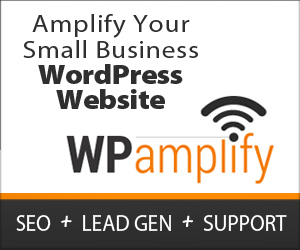 WPamplify specializes in helping small businesses have an online presence. We understand the unique needs of local businesses and work hard to help companies increase their business. If you are a small local business owner and need help creating your WebPress site, contact us to see how we can help you.